Being the largest importer of anime in North America comes with a huge fan base and a daunting host of responsibilities. Managing over 400 titles, attending 38 annual conventions, sending millions of emails, and engaging with a community that includes 1.5 million subscribers on YouTube all while seeking to expand your fan and media base can seem impossible… especially when your community gains strength and joy from user-driven initiatives that lie outside the realm of your control while still directly impacting your brand. 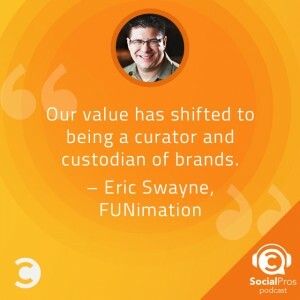 Amazingly, Eric and his Fan Engagement team navigate these waters with great success. They have found the formula to maintain just the right balance between actively managing their social community and indirectly enriching or supporting fan platforms when appropriate. One of the best things to keep in mind is that this is a business and therefore ahead of anything else, you need a good business and marketing head. The social team should be more than the tweeters… they should be the smartest strategist in the room. Lastly, being a fan or advocate is really powerful and important when you are taking your brand into the channels where the fans are most active. How about instead of one, we go with four living persons that are all prolific YouTubers? First would be Destin Sandlin to discuss his science-explaining channel and its huge community. Next would be Michelle Phan who has transformed the everyday of make-up into a ginormous personal brand. Last, but certainly not least, Rhett & Link who have morphed their friendship into a series of awesome viral videos and a daily TV show. All of these folks have created something that their community wants to come back to every single day. There are certainly lots of lessons we could learn from them on how we develop our own social communities.